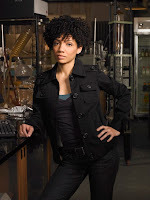 TV Guide has an exclusive interview with Jasika Nicole, who plays Astrid Farnsworth on Fringe. Jasika reveals some interesting information about her character, and some theories about William Bell. There are some mild-spoilers in the article, so you can read the spoiler-free version below, or head over to Spoilers.FringeTelevision.com to read the spoliers. When Jasika Nicole auditioned for J.J. Abrams' Fringe (Tuesdays, 9 pm/ET, Fox), she was told it was for a sci-fi series that incorporated humor. As FBI Special Agent Astrid Farnsworth, though, Nicole isn't exactly given a lot of the punchlines, saddled as she is with doing a lot of the heavy lifting in the lab of mad scientist Dr. Walter Bishop (John Noble). With a background in musical theater and a talent for drawing (check out her work, including an autobiographical comic, on her website), Jasika (it's pronounced jah-SEEK-uh) talks to us about being intimidated by Noble, why Astrid returned to work in the lab and her theory about the identity of the elusive William Bell. TVGuide.com: What's a sensible gal like Astrid doing with this bunch of crazies? Jasika Nicole: I think Astrid is really riveted by Olivia Dunham [who is played by Anna Torv]. I think for any woman starting out in her career, Agent Dunham is an exceptional role model. On Fringe, she is juxtaposed with the doctor, who is also brilliant, but was in an institution. I imagine that Astrid is trying to learn the balance of going after what you want in your career without having it be your whole life. Literally 15 minutes ago I was talking with Anna Torv about needing a scene to show that Astrid has a life outside of this lab. TVGuide.com: So what's coming up for Astrid? Will she have a larger role in future episodes? TVGuide.com: Do you have a backstory for Astrid? TVGuide.com: Tell me about working with John. Nicole: John is the funniest guy. I thought he would be very serious, and I was intimidated when I first met him, and I'm pretty sure he made fun of me because, you know, he likes to keep the mood light. Seeing him work is fascinating; it's like taking a master class. I just like to sit back and watch how he processes information and take notes. He's able to do a scene a million different ways within the span of five minutes because he's so able to connect with the artistic vision everyone has for this show. TVGuide.com: But why can't Dr. Bishop ever remember Astrid's name? Nicole: I wonder if it just started out as one joke, and it just ended up being so charming and funny that they kept it going. It's hard for me not to laugh; John's reading on it is so funny. We have this running joke where we're always trying to think of new names for Astrid. We were rehearsing a scene the other day and he called me "Afro," and I died. I fell on the floor laughing. He's also called me "Aspirin" and "Ostrich." TVGuide.com: And when he finally does pay attention to her, he attacks and sedates her. Why do you think Astrid came back to the lab? TVGuide.com: Personally, I think that Astrid is much more than she appears, that maybe she has some kind of special skill or power that's related to Dr. Bishop's work. Nicole: I think that is very, very possible. The best theory I heard so far is that I am William Bell. TVGuide.com: Wanna hear the best William Bell theory that I heard? That he's Blair Brown's prosthetic arm! Nicole: [Laughs] That's beautiful. At night, it leaves her body and goes out and does bad things.